Editor’s note: Last week, the 2018-19 University of Illinois College of Media Roger Ebert Fellows, Curtis Cook, Pari Apostolakos and Eunice Alpasan, covered their first full Ebertfest experience at the Virginia Theatre in downtown Champaign, Ill. Here are their impressions, from “Amazing Grace” to “Won’t You Be My Neighbor?” and beyond. An hour before the first screening of Ebertfest 2019, “Amazing Grace”—a long-lost concert film charting the creation of Aretha Franklin’s eponymous 1972 gospel album—longtime festival director Nate Kohn addressed a crowd of festival guests and participants Wednesday in Urbana, Ill., at the home of University of Illinois president Tim Killeen. Like Roger Ebert himself, Kohn was raised locally, and he noted that one of his favorite activities of the annual April film festival was observing the change of the city, year to year. Like the city, Ebertfest is an evolving beast. For the past six years, under the tutelage of Chaz Ebert, the festival continues to tinker with its formula. With one foot firmly planted in the festival’s initial focus on overlooked films, the other foot—guided by Chaz’s emphasis on empathy, kindness and compassion —has branched out further, this year focusing heavily on the passage of time. Throughout the 21 years of the festival’s operation, one of the few constants, alongside Nate and Chaz, has been Champaign’s Virginia Theatre. For anyone who has been to Ebertfest, they know the venue as a bit of an anomaly in its surrounding city. The Virginia features Corinthian-style columns adorned in cerulean hues and gold leaf, where the green and gold of the proscenium complement deep crimson curtains, and rows of red diamond-checked velvet seats and hundreds of feet of ornate trim occupy the auditorium. From the opening screening of “Amazing Grace,” which was followed by an onstage concert from the Martin Luther King Jr. Community Choir of Champaign-Urbana, to the show-stealing duo of Gina Gershon and Jennifer Tilly who spoke after Thursday night’s screening of “Bound,” to several screenings projected in 35mm film—a rarity in 2019—the Virginia was packed with entertainment for film lovers of all kinds. A Saturday highlight, director Morgan Neville’s enormously popular Fred Rogers documentary “Won’t You Be My Neighbor?,” came with the presentation of the Ebertfest Humanitarian Award. Neville was the third in the festival’s history to receive the honor. The film itself is a perfectly nuanced character study of a TV celebrity famous for his compassion and empathy around the world. Neville’s documentary looks beyond the surface of Rogers’ small-screen persona and examines how his kindness manifested itself on a daily basis. Visiting the festival this year in full was an eye-opener to say the least. In 2005, Ebert famously declared film to be “a machine that generates empathy.” This festival captures that sentiment perfectly. To watch hundreds of patrons interacting with each other throughout the week, mingling along the streets of Champaign, walking around West Side Park on a blustery weekday afternoon, perusing records at Exile on Main Street just a few blocks away—all of it was rewarding. Even in the short time that the festival runs, the openness and kindness of everyone involved is so inviting that one can’t help but feel the warmth of the community at their feet when they step under the Virginia’s laurel green marquee. For 98 years, the Virginia Theater has stood tall, a local relic amid that ever-evolving cityscape. And with the recent addition of several new luxury high-rises in a downtown area under perpetual renovation, that cityscape continues to evolve. Whatever the future brings, Ebertfest and its longtime home serve as a testament to longevity and to cultivating a sense of community beyond proximity. In coming years, in this great era of local change, the Virginia’s presence—along with its long-running festival tenant—will be even more appreciated. Ebertfest 2019 was a true learning experience for me, but not in the way I expected. Gershon and her “Bound” costar, Jennifer Tilly, delivered one the most entertaining post-screening discussions of the festival after the Thursday night showing of “Bound.” Their chemistry on-screen 23 years ago translated to the 2019 stage with ease. I wanted to befriend both of them instantly. Between takes of their hot-and-heavy love scenes in “Bound,” they recalled, they’d eat donuts and discuss the shoe sale at Barney’s. Even more intriguing were one-on-one discussions with festival attendees like Rita Coburn, co-director of the Maya Angelou documentary “Maya Angelou: And Still I Rise” who strongly recommended I watch “The Crown” on Netflix (apparently Princess Margaret is a mess). On a brief stroll over to the “Bound” screening, Coburn told me she thought Angelou would’ve been a fierce advocate of the #MeToo movement if she had lived to see it. It’s unfortunate the world will never see what that movement might’ve sparked in Angelou’s writing. If Ebertfest were structured like most festivals, that brief encounter might never have happened. 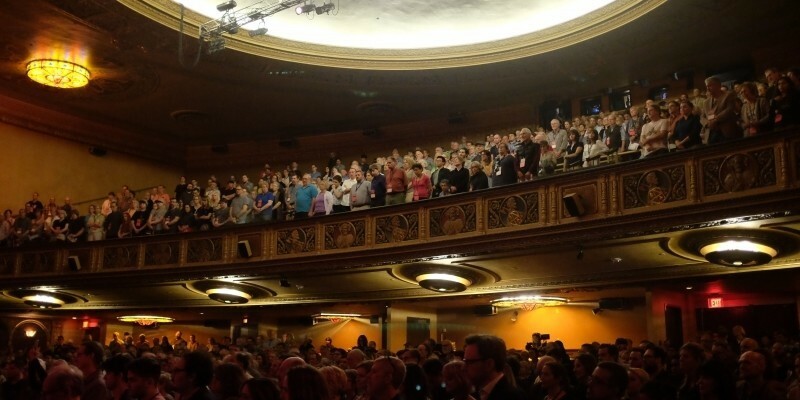 Since only one film is screened at a time, with all attendees watching the same thing at the same time, Ebertfest sparks conversation amongst the festgoers. May that aspect of it never change. Following Saturday’s screening of “Won’t You Be My Neighbor?” Chaz Ebert took the stage in tears, overcome with emotion as she remembered her late husband, whom she described as her own Fred Rogers. “Neighbor” director Morgan Neville took time afterwards to tell the Ebert Fellows a bit more about the film. One of the best moments in the documentary, 1960s archival footage of Rogers convincing, patiently, Sen. John O. Pastore to continue funding national public television, has a larger story behind it. Neville told us his that his research revealed Pastore did not have much of a childhood of his own. Growing up during the Great Depression, he was put to work in a factory at an extremely young age. Something happened when Rogers candidly shared with Pastore the compassionate message he was sending to children in his television program. Neville speculated that it must’ve touched the inner child of this senator who grew up too fast. After the Saturday screening of Morgan Neville’s 2018 documentary of the life of Fred Rogers, “Won’t You Be My Neighbor?”, Ebertfest co-founder and host Chaz Ebert came on stage in tears, mirroring the emotional state of many audience members. Attending the 21st edition of Ebertfest reminded all of us of Roger Ebert’s legacy. Despite his passing, his spirit permeated the four-day film festival and could be found in the people in attendance who knew him, as well as the movies shown on the big screen of the Virginia Theater in downtown Champaign. Filmmakers, critics, actors, musicians and movie distributors came from across the country to take part in Ebertfest, a festival that’s unlike any other. Empathy, forgiveness and compassion were major recurring themes found throughout this year’s work. Movies like “Rachel Getting Married” and “Won’t You Be My Neighbor?” stood out for the way they helped fulfill a heartfelt collective yearning. It was personally very much needed. 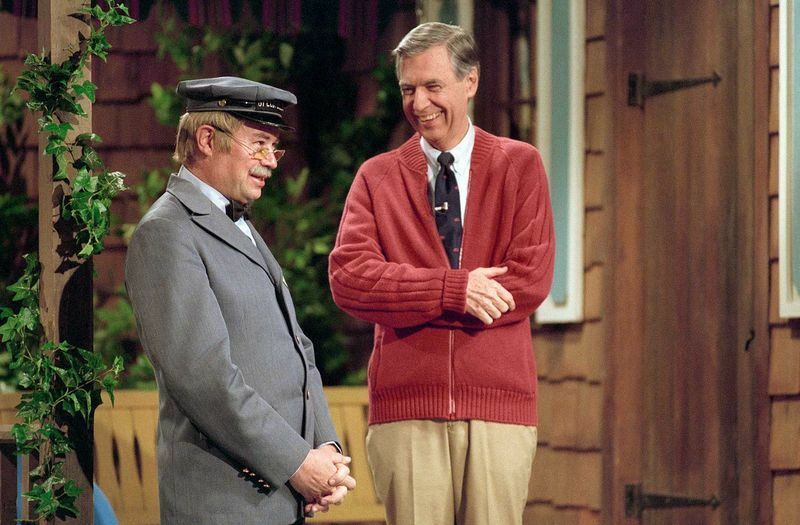 “Won’t You Be My Neighbor?” tells the story behind the children’s TV show “Mister Rogers’ Neighborhood” and the man whom filmmaker Neville reveals as being more than just a two-dimensional character. Even if you’re too young to have watched “Mr. Rogers’ Neighborhood,” the film still finds a way to connect with audiences unfamiliar with the subject. It doesn’t portray him as a saint, which Mr. Rogers’ widow was insistent on when speaking with Neville about the film. The kindness of Fred Rogers was refreshing and therapeutic to see on the big screen. But we also saw the vulnerability and internal struggles he faced and shared with the world. “When I saw this movie in the theater,” Chaz Ebert said Saturday, “it was the men in the audience who were crying. I was asking someone, ‘Why do you think that is?’ And they said, 'It’s so much more difficult for men to be able to tell someone that he needs them, to tell them that they love him or that they’re accepted. Or that they’re just fine just the way they are.'" Director Jonathan Demme’s 2008 drama “Rachel Getting Married” starring Anne Hathaway screened two days earlier, on Thursday. The film follows the character of Kym, released from drug rehab so she can attend the wedding of her older sister, played by Rosemarie DeWitt. Kym finds herself in a tug of war with her family, and screenwriter Jenny Lumet delves into the complicated nature of families. In one sequence, a dishwasher-organizing competition sprouts out of lighthearted fun between Kym’s father, played by Bill Irwin, and Rachel’s fiance, played by Tunde Adebimpe. The scene takes a sudden, stark, poignant turn that sucked all the air out of the room on screen—and out of the Virginia Theatre auditorium. Another Thursday screening, Jean Epstein’s 1923 French silent film “Coeur Fidele (The Faithful Heart),” made my list of Ebertfest favorites, as well as one of my favorite movie-watching experiences, period. The screening featured a live musical performance of the Alloy Orchestra. As someone who doesn’t often run have the opportunity to watch silent films, I found my jaw dropping thanks to the stunningly restored visuals combined with the seamless music performed live. The Alloy Orchestra included instruments like junk percussion, accordion, clarinet and synthesizers. The intense close-ups revealed the deathly glisten of the character’s eyes and the detailed texture of their skin. The cinematography was shockingly detailed, even psychedelic with the use of quick cuts, kaleidoscopic and distorted camera shots. The ambiguous ending to this melodramatic love story added a layer of depth that was unexpected and thought-provoking. Ebertfest recognizes a variety of films differing in genre, time period and representation. I hope in years to come, the festival’s breadth becomes more clearly reflected in who attends the festival. More community members and students of different ages and backgrounds should take the chance to attend. As a College of Media Roger Ebert Fellow, and first-year college student, it’s incredibly humbling to attend a film festival whose co-founder, Chaz Ebert, provided me this opportunity. To be surrounded by people who do so much to champion filmmaking makes for a celebration of the movies, and stories, we all share.